The client side of UP is built on Unity Engine allowing us to target a wide range of platforms. Small and quick to download with size of ~70MB UP runs brilliantly direct in your browser! A cornucopia of strange and mysterious enemies inhabit the lands of UP. From tunnelling Forest Slimes to the colossal Maulers of the Outlands. 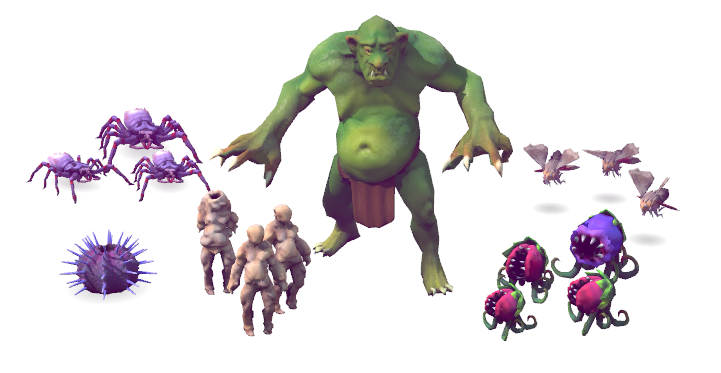 Each monster has it's own unique attacks, providing a wide range of exciting encounters that require different strategies. We also support multi-phase bosses and use the scripting system to enhance individual encounters. combine this with our instancing technology and you have the tools to create almost any encounter imaginable! We've pushed ARPG combat beyond what you might commonly expect in an isometric online focused game. Our systems allow us to animate characters in a 3D authoring package, then export attack collision from sweeping pairs of bones. We also export root bone movement making sure the characters feet remain firmly planted on the ground while in motion. This is a flexible system that allows us to create complex attacks with multiple colliders and tight animation choreography. UP has been developed from the ground up as an online game supporting up to 256 players in each world. UP uses a tile based map system reminiscent of a 2D RPG allowing rapid authoring of worlds up to 6600 Sq mi. We have many environments for UP including: Grassy plains, Spore filled forests, Lava caves and many more! Our atmospherics system lets us significantly change the look of the world helping us to maximise reuse of our assets while keeping the game feeling fresh. We support a variety of weather effects along with image based specular and ambient lighting. All our atmospherics settings can be smoothly interpolated and integrate into our script system allowing us to change atmospherics locally for breathtaking lighting sweeps in response to players progress through quests and the world. In 'me mode' the player can only see their own character and NPCs specifically relevant to them. They cannot be attacked by monsters or participate in combat. This allows us to craft small set pieces targeting an individual player to help bring the story to life. In 'Instance mode' the player enters a copy of the world created just for their party. This mode was implemented to let us polish gameplay for small groups of players. Examples might be a boss encounters or other cool set pieces such as escaping from a giant monster or progressing through a set of locked doors. 'Phase mode' is the game's default mode. In this mode all players are placed in 1 world together, although multiple phases can exist in the same physical location, allowing players to revisit areas they've previously completed while encountering new content. Our script is designed around choreographing virtual actors and simplifies many associated tasks. Scripts can be hot reloaded on the server with a single button press and require no updates to the client. Scripts hook into almost anything, from killing a monster to entering an area and many other gameplay events. Create and destroy props, move monsters, animate anything, control the weather, bring the world to life! This is the first character we added. His combat is based on chaining attacks with the left and right mouse buttons. More attacks unlock as you find new weapons, he also has 3 ability slots which we intend to use to add rage based skill items! We wanted to create a character based around FPS style weapon switching. The gunner equips multiple weapons, each with a primary and secondary fire. He can also equip ability items such as mines. The healer is the final class we expect to add to the game. Our intention is to create a shape shifting based healer who can morph into an unstoppable giant. In human form they will have a range of heal over time and direct healing spells. UP approaches character customisation using a number of novel techniques to keep draw calls optimal. A character in UP always costs a single draw call, regardless of equipment keeping performance reasonable even with 50 player characters on screen. Our system also allows us to attach together a number of mesh chunks to generate a single item model using a semi-procedural system; this allows even a small team to create large numbers of items in a timely fashion.